There's a gradual increase in difficulty, but the focus remains on flexibility and core strength. This marks Week Two of D Magazine’s Workout of the Week series, a 10-week plan created by Equinox Highland Park‘s Seamus Dooley. We started you off with some baby steps in Week One, but now it’s time to advance our moves. Week Two’s exercises continue to focus on mobility, stability, lower body movement, and upper body movement. The progression is simply elevated in difficulty and intensity. But remember: This is a 10-week progression, so we are gradually increasing exertion. Place yourself in the top of a push-up position. You’ll recall this initial move from Week One. This week, we’ll focus on alternating your hip drive. Try to maintain that position for two to three seconds on each side. Dooley says you will find this move to be more dynamic than last week. Also, it will help accelerate your heart rate. This works to relieve unnecessary pressure on the lower back. Following the same theme, we make these patterns a bit more dynamic in nature. Walk your body out slowly to the finished plank position. This movement requires stability not only from your trunk but from your entire body. This added movement will also aid in heart rate elevation. Last week we learned a reverse lunge in the sagittal plane of motion. As humans, we are constantly moving in all three planes of motion. This week we learn the second plane of motion, the frontal plane. 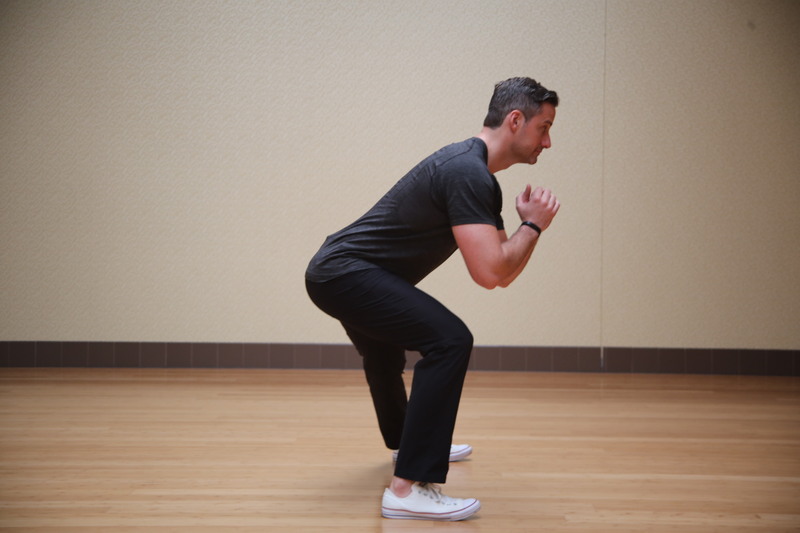 This lunge pattern has us move in the frontal plane as we take a strong lateral step to the side and stabilize our hip and core. It is important to sit back into your hip, while keeping your weight on your heels and your knee lined up with your toes and hip. Dooley offered a helpful and visual tip to drive your body back to the starting position. Think of pushing the floor away from you. We prepared ourselves for this movement very well last week. Now, it’s time to put this push-up in motion. A proper push-up is a full body movement. Maintaining tension in your lower half and trunk is most important, as is hip placement. Drive your tailbone down to the ground. Dooley says this will activate your trunk and help you keep a strong core during the movement. Bring your body down as low as you can go and push the floor away from you to drive your body back up to the top starting position. You can regress this, if you like, by using a table or a bench to push off from until you are ready to use the floor. Once you’ve completed all four sections, this represents one complete circuit. Dooley suggests doing the circuit three times, resting as needed. Just as in Week One, you can make the circuit more challenging by increasing the amount of times you go through the circuit, limiting your rest. If you’re looking to add difficulty, you can always lengthen any of the timed components to challenge yourself. More reps are always welcome, too, if you feel that the progression isn’t challenging enough.